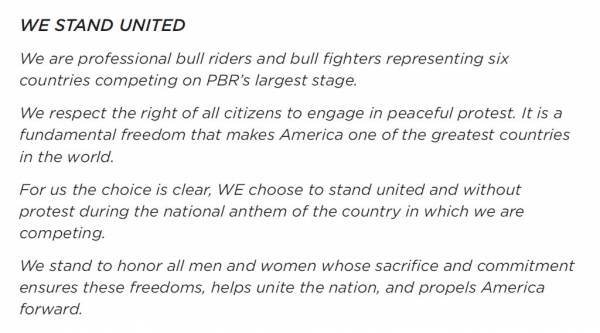 Last year, Professional Bull Riders (PBR) was the only major professional sport whose athletes took a pledge to always stand for the National Anthem. The pledge they signed was sent out to all of their fans. The Professional Bull Riders sent out this statement today. This is a natural evolution of 24 years of unbridled patriotism among the cowboys who founded this great American sport. PBR CEO Sean Gleason will tell you he plans to ratchet up the sport’s stance for America. Sean believes in freedom of expression but has zero tolerance for anyone using the dirt of PBR for political protest, thereby disrespecting the men and women who die for our freedoms. Every weekend, PBR honors a military or first responder hero on the dirt before the National Anthem. Fans are responding. Earlier this month in Springfield (Sept. 10), PBR was the No. 2 rated sport on TV, trailing only the NFL. 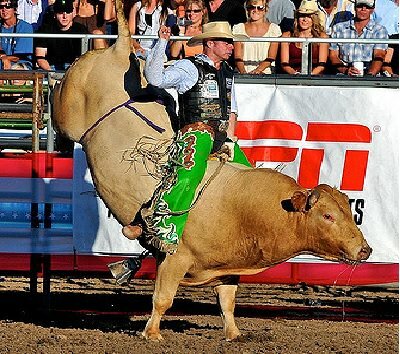 More people were watching bull riding cowboys representing toughness, courage, honesty, grit and love of country than US Open tennis on ESPN or MLB on TBS. (BTW, if you don’t make the eight seconds on the bull, you don’t get paid. No handouts here!) The World Finals are scheduled this year in Las Vegas on November 1-5.